Much of the perceived conflict between science and religion centers on how one should view the Bible's account of creation. The vast majority of scientists and theologians are willing to accept the fact that the Bible was never intended to be read primarily or even secondarily as a scientific text, and even among those who insist that God played a crucial role in the creation, most are willing to accept that this creation proceeded through a mostly natural process involving forces such as tectonic shifts and biological evolution. The real issue is one of authority -- is God's Word the authority, or is man's word the authority? So, couldn't God have used evolution to create? The answer is No. A belief in millions of years of evolution not only contradicts the clear teaching of Genesis and the rest of Scripture but also impugns the character of God. He told us in the book of Genesis that He created the whole universe and everything in it in six days by His word: "Then God said ... ." His Word is the evidence of how and when God created, and His Word is incredibly clear. Setting aside, for a moment, all of the scientific arguments and technical details regarding evolution and the age of the Earth, is it true that fidelity to the biblical text in Genesis 1-2 requires us to turn our backs modern science? Or, at the least, can one consistently interpret Genesis 1-2 in a literal scientific sense, yet not also read the rest of the Old Testament in this fashion? Conversely, if we take a more flexible approach to the remainder of the Old Testament, are we justified in taking a very strict reading of Gen. 1-2? For example, what view of cosmology does a strictly literal reading of the Old Testament lead one to? The Earth itself is flat and immovable, encompassed by a circle (like a coin), and set on a foundation of pillars. Above the Earth stands a "firmament" (later thought to be a system of crystalline spheres), a few hundred (or at most a few thousand) feet above the Earth, on which the stars, planets, sun and moon revolve. Heaven or the realm of God is a set of chambers just above the firmament. 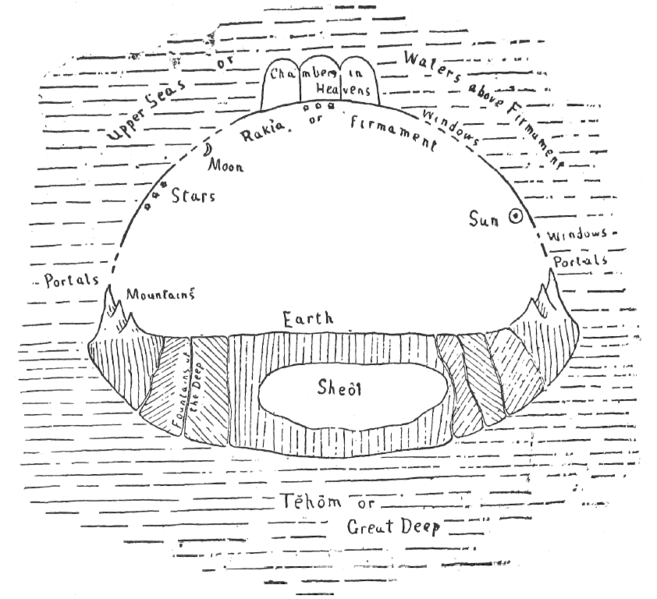 Above the firmament and the heavenly chambers lies the upper seas or the "waters above the firmament"; below the Earth and the underworld lie the lower seas or the Great Deep. Gen. 1:7: "And God made the firmament, and divided the waters which were under the firmament from the waters which were above the firmament: and it was so." Gen. 11:4: "And they said, Go to, let us build us a city and a tower, whose top may reach unto heaven;"
Gen. 7:11: "...the same day were all the fountains of the great deep broken up, and the windows of heaven were opened." Jos. 10:13: "So the sun stood still in the midst of heaven, and hasted not to go down about a whole day." 1 Sam. 2:8: "...for the pillars of the earth are the Lord's, and he hath set the world upon them." 1 Chron. 16:30: "the world also shall be stable, that it be not moved." Job 9:6: "...the pillars thereof [of the earth] tremble." Job 28:24: "For he looketh to the ends of the earth, and seeth under the whole heaven;"
Psa. 28:19: "The Lord sitteth upon the flood [cosmic sea]; yea, the Lord sitteth King for ever." Psa. 93:1: "...the world also is stablished, that it cannot be moved." Psa. 104:5: "Who laid the foundations of the earth, that it should not be removed for ever." Isa. 40:22: "It is he that sitteth upon the circle of the earth, and the inhabitants thereof are as grasshoppers; that stretcheth out the heavens as a curtain, and spreadeth them out as a tent to dwell in:"
Needless to say, almost all readers today view these verses only as literary devices emphasizing the glory of God, not as literal scientific fact. But literalists are left to explain why they remain in an absolutely inerrant text. In particular, these items call into question the notion of adopting a flexible approach to passages such as the above that describe the ancient cosmology, yet still insisting on a highly literal reading of the Genesis creation scriptures. After all, if one agrees that passages, such as those above, that reflect the ancient cosmology are only literary devices extolling the greatness of God, but not to be read as literal scientific fact, then why should Gen. 1-2, which also describes the physical world, be singled out for a highly literal interpretation? In particular, why insist on a literal six-day (or 6000-year) creation, completing in approximately 4000 BCE and not involving any evolution, all because Gen. 1-2 seems to describe such a creation, yet ignore numerous other biblical passages on the same general topic (the heavens, the Earth and their origin) which reflect a cosmology that no reasonable person today could accept? This, in a nutshell, is the central difficulty in taking a literal, inerrant approach to the Bible and using this worldview as the foundation for a young-earth creationist view: not only is such an approach utterly in conflict with vast amounts of scientific data, but also it would require a 21st century person to adopt the ancient cosmology and become a flat-earth advocate! With the scriptures it is a matter of treating about the faith. For that reason, as I have noted repeatedly, if anyone, not understanding the mode of divine eloquence, should find something about these matters [about the physical universe] in our books, or hear of the same from those books, of such a kind that it seems to be at variance with the perceptions of his own rational faculties, let him believe that these other things are in no way necessary to the admonitions or accounts or predictions of the scriptures. In summary, while some creationist and intelligent design writers even today teach that the Bible is absolutely inerrant and, by implication, that Genesis must be read as a complete and technically precise scientific treatise, abundant evidence even within the Bible itself shows that such notions are indefensible. Once one backs away from a literal-inerrant approach to the Bible, most of the difficulties that are typically mentioned in the context of science and religion either disappear or fade into relative insignificance. For additional discussion, see Bible archaeology, Bible chronology, Bible-creation, Bible-inerrant, Bible-science and Creation.